Jumpstart your new year. Elevate your potential. Adobe Photoshop has long been the world-standard image-editing, photo-retouching and web graphics software program. This course presents a complete survey of the Photoshop interface – its features, capabilities and uses. Learn to create and manipulate bitmapped, grayscale, and color images through a series of hands-on-exercises. You will also learn how to create sophisticated images for both print and the web. No prior experience necessary. NOTE: A basic familiarity with computers recommended. After enrolling, you may be able to use your PCA&D student ID and receive a discount on the Adobe Suite. *this class is currently full. email ce@pcad.edu or call 717-396-7833 ext 1019 to be added to wait list. This course is an introduction to the world of digital photography and the unique opportunities and challenges it presents. Confused about all of the settings on your camera? You will become proficient in the use of a digital camera, understanding how to control exposure through aperture and shutter settings. Learn basic photographic composition, basic editing with Adobe Photoshop, ISO, along with image sizing, what it means, and how it impacts the final result. Students must bring a 35mm digital camera that allows control and manipulation of exposure, instruction manual, and USB cord. Digital cameras that meet the requirement: Canon: Any EOS and Rebel digital camera; Fuji: Any Fine Pix “S” series; Kodak: Any “P” series; Nikon: Any “D” series; Olympus: Any “E” series; Panasonic: MMc‐L1K SLR; Pentax: Any K series; Sigma: SD‐14; Sony: Any DSLR‐A100 camera. Others may be applicable. Marketing is not just about getting your sales message online. One of the most effective ways to market your business or organization is by telling your story. This class will examine content marketing from a variety of perspectives, from blogging and video, to other forms of digital storytelling. This class will be firmly grounded in the latest theories of communication, blogging and digital marketing, yet offer practical, hands-on experience and lessons which can be put into practice immediately. NOTE: This class counts towards the Social Media Marketing certificate. Is your digital presence really connecting with your target audience? Measuring the results of your social media efforts is key to the success of your comprehensive marketing plan. In this class you will learn how to interpret your analytics to help you build and maintain a strong digital presence. You'll also learn how to create a social media policy for your company or organization and how to integrate online and offline marketing. Plus, understand the basics of search engine optimization as part of your content strategy. NOTE: This class counts towards the Social Media Marketing certificate. Adobe InDesign is a page layout program used to create everything from restaurant menus to brochures and magazines. An integral part of any designer’s Adobe toolkit – along with Photoshop and Illustrator – this program allows you to produce pages quickly and output them reliably – combining images and text for compelling results. In addition to learning to manage the Adobe InDesign program, you will complete your own design project in preparation for a variety of real-world design challenges. NOTE: A basic familiarity with computers recommended. After enrolling, you may be able to use your PCA&D student ID and receive a discount on the Adobe Suite. This class counts towards both the Digital Design: Print certificates. Learn to create your own website or blog using the WordPress platform. WordPress is one of the most popular and easy to use programs for blogging and website creation. You’ll learn the difference between wordpress.com and .org and how to decide which is best for you. This course will teach you how to setup your account, write posts, and navigate through the WordPress dashboard. It will cover custom themes, blog design, managing posts, adding new pages and links, installing plug-ins, search engine optimization tips, and adding analytics. See first-hand why WordPress is a valuable tool for individuals and business owners to use to create or maintain their own blog and website. You’ll be able to leave the course with a new website up and running. NOTE: Previous HTML experience recommended but not required. You do not need to have an existing website to take this course. A personal computer is not necessary. This class counts towards the Digital Design: Web or Social Media Marketing certificate. This course is tailored to professionals in the creative industry including designers, illustrators, writers, artists, makers, and craftspeople who wish to understand the necessary steps in starting and running their business. Class lectures and discussions will include: writing and executing a business and marketing plan, branding their business, self-promotion using social media and online portfolio sites, presentation theory, types of portfolios, taxes and legal issues related to self-employment, basic business procedures (finding work, negotiating project specifications, contracts, agreements and getting paid), setting up a home studio/equipment/hardware-software, and how to interview. This course is tailored to individuals interested in learning more about typography and how to use type effectively to enhance their business and/or personal communications. This objective of this course is to help individuals gain a basic understanding about type and typography. The class will include a brief history of typography, font technology, typeface anatomy, type identification and classification, letter, word and line spacing, page composition, proportion, hierarchy and contrast. Typographic legibility and aesthetics will be emphasized. Learn some simple tips, tricks, and techniques for getting the photo that will create the most engagement on your social media accounts. Different social media platforms call for different strategies. Learn how natural light can be used to your benefit, and how the choice of perspective, focus and background can set your photos apart from others. One of the hottest and most effective tools for small business marketing is video. From branded YouTube channels to Facebook Live and Periscope, businesses small and large are beginning to understand the importance of video content marketing. This class will explore the different video options available to business, with strategies on how to make these tools work for you. With 400 million users on Instagram and 100 million daily users on Snapchat, these are two hot social apps your business can no longer ignore. In this three hour workshop, learn the basics of Instagram and Snapchat, how to use the apps and how to harness each app's special features for your brand. This is ideal for marketing professionals and business owners who are Snapchat novices and want to gain a better understanding of what the platform features can do. Learn the demographics of each platform's users, what makes for engaging and memorable content, how to monitor your impact, and how often to share. this class is no longer accepting registrations. Botanical art draws together art and science in this time-honored genre. Contemporary botanical artists work in a variety of media, including graphite and watercolor. Perfect for the casual artist or the accomplished illustrator, join us to learn to depict our natural world accurately and artistically. All experience levels welcome. Explore graphite rendering of leaves and botanical specimens with an emphasis on drawing skills, then move on to watercolor or colored pencil as the weeks progress. Each class will consist of a brief discussion on the topic at hand followed by guided instruction during studio time. Instructor demonstrations along the way. Botanical specimens will be provided. Focusing on working with and understanding charcoal as an artistic medium, this course covers various methods of both additive and subtractive techniques while focusing on the still-life as our subject. We’ll be covering gesture, proportion, and perspective, as well as light and value. This course is perfect for the artist who wants an introduction to the medium, but also for the artist who wants to sure-up their drawing skill set. This class is open to all skill levels and paint types, but will focus on acrylic paint during demonstrations. Acrylic paint is an ideal medium for beginners because the paint is water soluble, cleans up easily, and dries quickly. This makes acrylics versatile and easy to use. Learn how to use acrylics while painting from observation: both still life and room interiors. Explore various materials, blending, washes, glazes, other techniques, and color theory in a painting course ideal for any skill level wishing beginner instruction or studio time with an expert faculty member. Want to publish your own book? Why not make it a coloring book! This class will teach students how to create their own coloring book from start to finish. Topics covered will include theme development and ideation, the ins-and-outs of illustrating for coloring books, and how to publish your own coloring book. Students will work as a class to develop and illustrate their coloring book, while learning how to provide constructive feedback to each other on their work. At the end of the class, each student will leave with copies of the coloring book they helped create! Learn techniques for transforming your artwork into an artist book, as well as, traditional book making and binding. We will create “accordion,” “flag,” and “window” books as ways to showcase 2- dimesional artwork, photography, or poetry. Binding stitches, case binding, covering techniques and incorporating handmade paper will also be explored in depth. By the end of the class you will have learned the basics of book making, and will have created 6 mini books of your own. Turn that blank, boring sketchbook into a power plant of creative ideas! Sketchbooks are the window into the soul of any artist, I want to help you clean that window so you have a very clear vision of what you want and where you want to go. Each week we will learn a new sketchbook secret that will not only challenge you the artist but will also aid you in the clarity of your thoughts. We will cover composition, story, basic and advanced drawing techniques, materials, and many more electrifying ideas. Explore traditional and contemporary methods of oil painting, using still-life as subject matter. The course will focus on artistic development of both technical and conceptual elements of painting for novice and advanced painters alike. With an emphasis on light, color, and space, students will create paintings from direct observation. Enjoy meeting new people, and share your love of painting together! This is an introduction to relief printmaking. Students will use hand-carving techniques to explore mark making, composition, and the fundamentals of drawing and design while creating blocks. These blocks will be printed using both the press and hand printing techniques to create reproducible imagery. Throughout this course students will gain a strong understanding of the proper handling of the tools and equipment in the print shop. In this course, you will learn the essentials of sewing, making pattern adjustments and fitting via the creation of a personalized and stylish dress or vest. Take a base pattern and learn how to manipulate it to fit their body. Through the process of sewing the garment, you will learn a variety of seaming methods, zipper setting, hemming, setting a lining and setting facings. You will also be guided through the fitting process, making alterations as needed, to ensure perfect fit. Upon completion of this course, students should feel comfortable following basic patterns, and comfortable performing simple pattern alterations. They will also be capable of executing common alterations and repairs to existing garments. Beginner to intermediate skill levels welcome. Recommended reading: Overdressed : The Shockingly High Cost of Fast Fashion by Elizabeth Cline. Want to take a class that teaches new techniques while providing a supportive workshop environment? Look no further–this class focuses on short fiction and non fiction by introducing students to published works, breaking down the craft, and challenging students to produce their own original writing. The course surveys creative non-fiction, magical realism, flash fiction, post-colonial and post-modern genres. Students will analyze pieces with guided instruction and learn to adopt the style in their own voice. Join us to produce new writing and expand your knowledge of great and contemporary writers. Learn the basics of making your own paper during this one-day workshop. We will create paper from recycled materials, plant fibers, flowers, and inks. 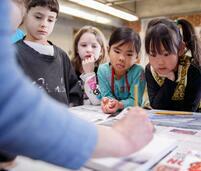 We will also explore Suminagashi paper marbling, watermarks, and creating images with paper pulp. Love photography, but feel like your photos could be better? You will gain an understanding of how to control your digital SLR Camera , create eye-catching compositions, develop your photography portfolio, and hone your voice and vision as an artist. If you have an interest in photography as a career or hobby, this class if for you. Small class sizes allow the instructor to tailor the class to meet your needs, no experiences required. 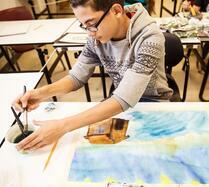 This class engages students in the best practices while in a painting studio. These practices explore the technical and theoretical creation of works of art. Through an exploration of the foundations of painting development, students will be encouraged to develop their own observational skills and visual language while utilizing composition, color, cropping and context. Peer review and group critique will help with support and growth. Need to put together a portfolio, but not sure how? This workshop teaches you how to assemble a portfolio for admission to an art college. Learn how to visually and verbally present your work and select pieces for your portfolio. A variety of portfolio styles are shown and discussed. This is an excellent workshop if you are considering a college education in the visual arts. A class for the budding artist to experience a range of art making techniques and materials. K12 Certified Art instructors will guide your child through a variety of materials and techniques, such as, drawing, painting, and at least one 3D project. During this once per week class students will experience their imagination coming to life. All youth studio instructors are K-12 certified with thorough background clearances, and assignments vary for each semester and section, so there is always something new to learn! NOTE: Supplies are provided for Youth Studio courses. Your child has a creative spark; let’s nurture their curiosity and artistic ability in a supportive weekly class that encourages exploration. Using the principles of design and art history as a foundation, your pre-teen / teen will learn the significance of thinking like an artist as they learn a mix of different art-making techniques, including drawing, painting, sculpting, and more. 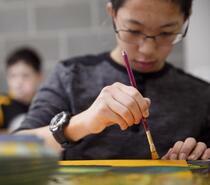 Lessons will help inform and enhance their personal development as a young artist. This program is open to all skill levels, and provides an atmosphere for self-discovery, camaraderie, and small group learning. At the end of the session, each student will have a mini-exhibition during the larger Youth Exhibition & Reception to celebrate their artistic journey. All materials and supplies included in the cost of the class. YS 40, Tuesday, January 31 - March 21, 10:30 a.m. - 11:30 a.m.
Let your child explore their inner artist, build a solid art foundation, and leave the mess with us. Through this 8-week class, students will gain experience in art-making techniques while developing their creative thought process. Students will be guided through discovery learning anchored in art history, and methods of creating. Because the class size is limited, each child will be met at their skill level with individually tailored lessons. Keep learning after class. Parents will receive some helpful prompts for art history lessons such as web links to videos, book references, short bios of famous artists, etc. All materials and supplies are provided for this class. Open to ages 6-13. The college is conveniently located in downtown Lancaster within a short walk from many coffee shops, bakeries, Central Market (open on Tuesday), public library, galleries, and more for parents and younger siblings to explore. Elevate your potential. Jumpstart your new year. Ignite your passion for making art and jumpstart new professional skills this winter. Join PCA&D, the region’s leader in art and design education, and unleash your personal potential. Elevate your thinking, making, and design skills to new levels in classes for children, teens, and adults. New daytime classes on weekdays for adults, Saturday classes for kids and teens, and our weeknight classes are convenient for working professionals.